Friday’s job report showed hiring has slowed in the service sector, which has fueled much of the labor market growth this year. The year-over-year change in private sector wage charted against year-over-year change in private sector job gains and the monthly unemployment rate. Seasonally adjusted nonfarm jobs are growing at almost the same pace as they were early last year. See Wall Street Journal report. Local numbers won’t be available until late this month, but there are two charts from the July local data that are worthy of review both as trend tracking and a snapshot of how three primary indicators behave about each other. The full July report and additional charts can be found by CLICKING HERE. 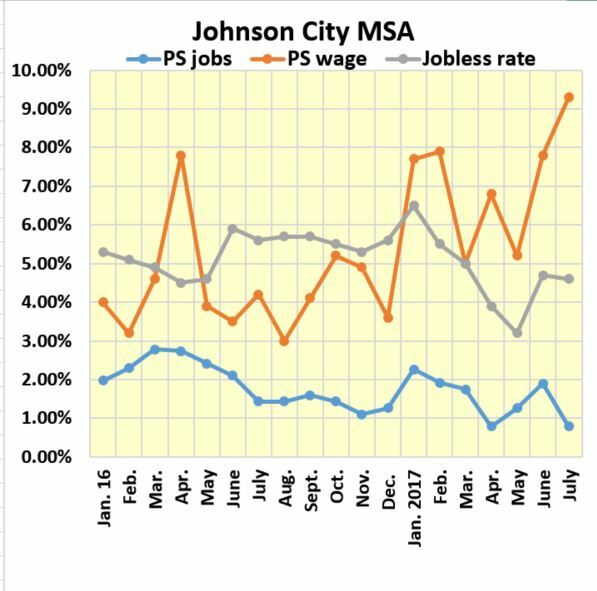 So far, this year, Johnson City Metropolitan Statistical private sector workers are seeing an average weekly wage growth that exceeds what we see on the national level. It has consistently outperformed the year-over-year gain for private sector jobs and the unemployment rate every month so far, this year. This follows long stretch (more than two years) of declines during the recovery from the Great Recession. 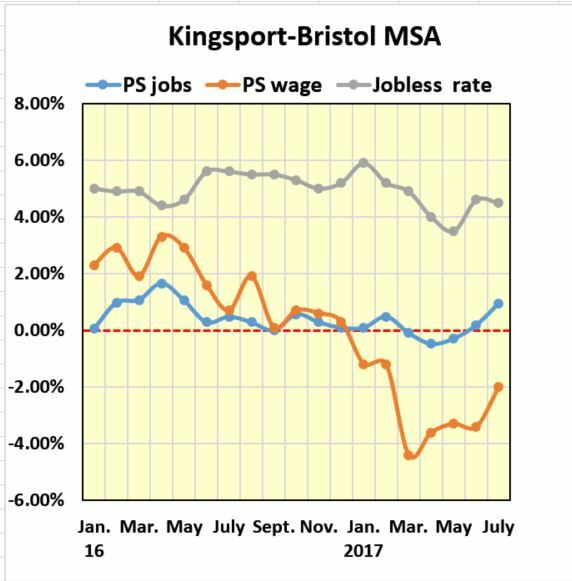 During that same period, the average private sector wage in the Kingsport-Bristol MSA outperformed Johnson City every month. An opposite dynamic is occurring in the four-county Kingsport-Bristol MSA. Private sector wages began a nose dive the first of the year that bottomed in March. The year-over-year metric is still negative, but the rate of decline is improving. That improvement roughly parallels the year-over-year growth rate for private sector jobs. Wages have underperformed the unemployment rate for past 19 months. Data Sources: July Bureau of Labor Statistics payroll, household, and private sector wage reports.